Las Palmas visit on one day is impossible. You can visit the main sites but then you have not seen the half. 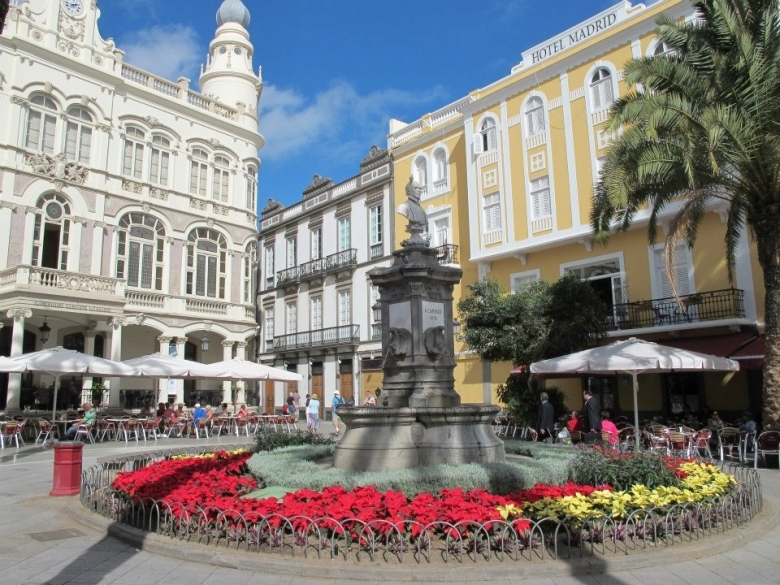 Especially if you are interested in culture and history, you can definitely consider a vacation in Las Palmas. The old historic center, which the Canary population named Vegueta is definitely worth a tour. This district Vegueta tells you the rich history of this Canarian town. One of the main squares with a beautiful history in the city is undeniably the Plaza Santa Ana with beautiful houses such as the Episcopal Palace, the Government House (Casa Regental) and the eponymous Santa Ana Cathedral. The first square ever built in the city has a typical Canarian architecture bears also the name of the patron saint of Gran Canaria. The Santa Ana plaza is landscaped to South American model. Plaza Santa Ana was intended at first for the administrative services for the citizens of Gran Canaria. You may already have observed during the tour of the rectangular square, 8 different dog breeds adorn the square. The dogs are placed according to the history somewhere between 1895 and 1897 and donated by James Miller from London. According initials on the dogs have two sculptors created these sculptures. The cast iron sculptures are created by in every way “Barbezat and Cie” in Paris. Around the Plaza de Santa Ana is a lot of culture from Las Palmas to be found. On the other side of the cathedral, you can see the Casa Consistorial. The Casa Consistorial is one of the first administrative buildings founded in 1856 by the conquerors of Gran Canaria. The building has a rich history carries with him, that has been completely renovated in recent years. During the restorationare several forgotten authentic pieces with historic value founded. 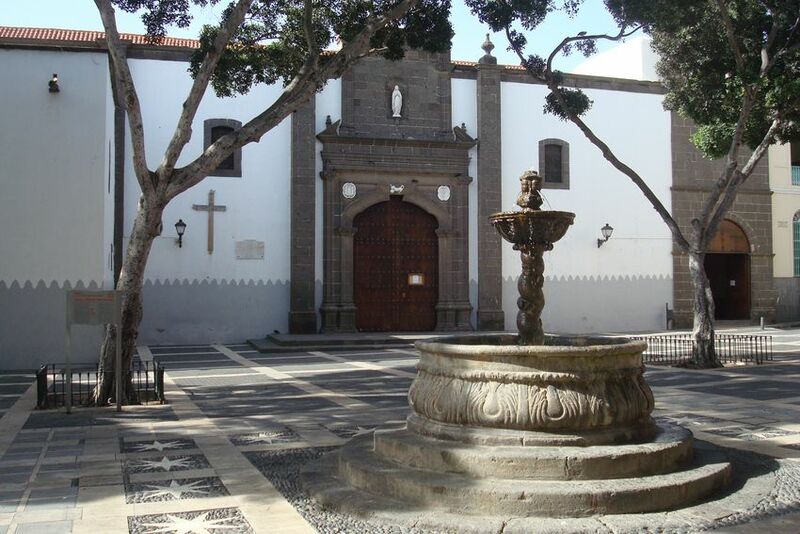 Adjacent to the Plaza Santa Ana you look in the other direction at the first church of the island of Gran Canaria. This cathedral was built by the Catholic Kings after the conquest of Gran Canaria. The construction of the Santa Ana cathedral is described around 1500 and would have lasted four centuries. Because different conflicts with architects, the architectural style of the cathedral is Gothic, Renaissance and neo-classical. During a tour inside the cathedral you can discover various works of art. In the south wing is the Museum of Sacred art and a patio of orange trees. Paintings, sacred art objects and other subjects from the past are exhibited . The cathedral is open Monday to Friday from 10.00 to 16.30, on Saturdays from 10:00 to 13:30. Closed to visitors on Sundays. Do you want visit one of the two towers for a magnificent view of Las Palmas, then theirs is there is for you an elevator. The Literary Cabinet is a historic building from 1844 and be used today for example for a marriage, a library, conferences and many other occasions. Inside the building is also a restaurant. It is important heritage for Las Palmas through its rich history. The Literary Cabinet is located on the beautiful Plaza de Caraisco. Would you take a tour to the various museums, the Santa Ana Cathedral, Columbus house and visit many other attractions in Las Palmas area, then you can buy a LPACard. You will pay € 15 for adults and € 8 for children. For online purchases are reductions possible. This card can be purchased locally or over the Internet. City break to Las Palmas ?